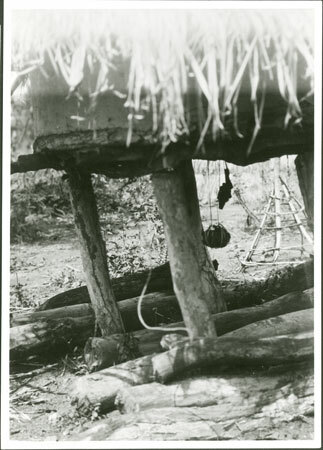 Some bundles of ngua or medicines hanging from beneath a household's granary, used to help ensure a propserous and peaceful feast. Since these medicines are hung beneath a granary, they may well be dakadiya and ngamu, medicines used on newly harvested crop piles to ensure increase. Morton, Chris. "Zande feast medicines" Southern Sudan Project (in development). 03 Jan. 2006. Pitt Rivers Museum. <http://southernsudan.prm.ox.ac.uk/details/2005.111.14/>.